Just one word: The Party in Hell: ROCKED! Three Cheers! 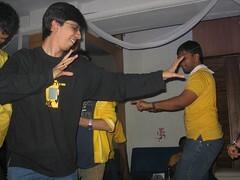 to Saurabh who organized a great evening for the entire office team. The planning was just like any other corporate event but with a lot of warmth and detailing gone into it. Starting from the party posters @ the office to the ambient posters – the music rocked the floors and liquor flowed easily. Thanks to the high spirits, even the die-hard rockers didn’t care what music was playing and just hit the dance floor to make the best of the moment and party as if there was no tomorrow. But I think somewhere they stopped knowing the big night was yet to come, this was only the start of the celebrations. I think it was indeed a very nice idea to pass around the TYN board (see photo on left) and let the team sign their new year messages. This I suppose will soon be placed at our office for all to see. Way to go team fellows. And of course we look forward to see the final edited video footage from the house of the multimedia team. By 2AM we were all on a great high and decided to return back to the office for another session of fun, since there were no trains to return home after the late night revellery. I was tired so I drove back home but I am sure the gang at office enjoyed their round two. Here’s wishing the entire team a great year ahead. Wishing you and your family, a very happy and prosperous new year! !